"Better Place" receives permit to import electric cars to Israel; cars to arrive within two weeks. A company formed by an Israeli has been chosen to be one of the leaders in bringing environmentally friendly cars to Israel. Globes reported earlier this week that Israel’s Ministry of Transportation has given electric car venture Better Place LLC a permit to import 13 Renault Fluence electric cars for testing. The vehicles, which meet strict EU 5 emissions standards, will arrive in Israel within two weeks. They will test the battery recharging stations that already exist at several sites in Israel, including at Better Place's Visitors Center located at Pi Glilot outside Tel Aviv. Israel has long been committed to electric cars, and has expressed hope that by the end of this year it will be the world’s first nation to host a national electric car network. The electric car developed by Better Place has no exhaust pipe and no gas cap, but rather a simple electric socket. It runs on a 450-lb. lithium-ion battery and can go as far as 140 miles before the battery needs to be swapped or recharged at the recharging stations. Two hundred such stations are expected to be available around the country in the future. 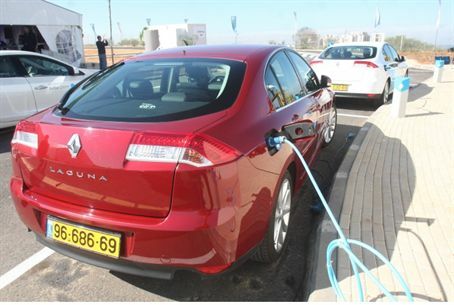 Importing the electric cars was made possible thanks to Transportation Minister Yisrael Katz, who signed a directive on new goods and services, which include relaxations on new import permits for cars. Once the Renault Fluence meets Israeli standards, the Ministry’s Motor Vehicles Department will issue the final approval on the imports, allowing them to be marketed in Israel in 2011. Globes quoted Katz as saying that the ministry would continue to support projects that contribute to vehicle safety and to the environment. He said that more than 10,000 hybrid cars and 8,000 natural gas driven vehicles are currently in use in Israel. Better Place founder Shai Agassi has made it his mission to move the world from oil-based transportation to sustainable-energy transportation. He does this by working with government leaders, auto manufacturers, energy companies and others around the world. He was named one of the world’s 100 most influential people by Time Magazine in 2009. He was also named by Scientific American Magazine as one of the “Scientific American 10”, a select group of ten people who have demonstrated their commitment to assuring that the benefits of new technologies and knowledge accrue to humanity.